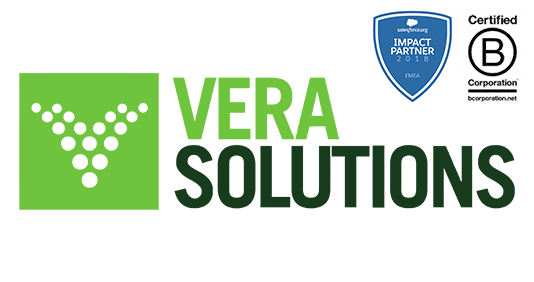 Vera Solutions is a global social enterprise and Certified B Corporation® building cloud and mobile applications for social impact organizations worldwide. Our clients—more than 260 organizations in over 50 countries—include major iNGOs and grant-making organizations, social enterprises, and community-based organizations. Our solutions help organizations working in health, education, and development to collect, analyze and utilize real-time, high-quality programmatic data, automate processes, and work more efficiently and effectively. Vera’s work is centered on the Force.com platform, the world’s leading cloud application development platform. Vera is a growing organization, with more than 55 full-time staff based in Amsterdam, Boston, Cape Town, Geneva, London, Mumbai, São Paulo, and Washington DC. Vera is a Salesforce.org International Impact Partner and an ANDE member. We have been honored with Global Good Fund, Echoing Green, Rainer Arnhold, Dasra Social Impact, Bluhm/Helfand Social Innovation Fellowships, the Genesis Prize, and have been featured in Forbes Magazine’s 30 Under 30 Social Entrepreneurs and Entrepreneur Magazine’s 30 Startups to Watch. We are looking for a dedicated Solutions Architect who is capable of navigating complex client requirements to design world class systems with precision, enthusiasm, and dedication to quality. The Solutions Architect (SA) is responsible for the end-to end design and delivery of projects. This includes leading discovery and design workshops with clients, synthesizing client requirements into solutions, implementing complex solutions on the Salesforce Platform, providing technical expertise during sales, and supporting project managers to successfully deliver high-quality projects on time and budget. The SA will focus on discovery, design, and implementation of client systems. The SA should be energized by opportunities to connect directly with our clients, and have a track record of implementing high-stakes projects across a portfolio of challenging projects with limited supervision. Internally, the Solution Architect will be joining a team of other SAs that support each other. In addition the SA will mentor less technical members of consulting units. The SA will lead discovery workshops with clients. These will either be remotely or in person, so you will be willing to travel for onsite workshops. The SA is responsible for ensuring that a complete picture of the client needs are uncovered so that the resulting implementation meets all of the needs of a client. The SA must ensure that all documentation required is completed to allow for the future success of the project. The SA is responsible for designing a solution that meets all of a clients requirements in a manner that is appropriate for a client’s capacity and budget. During the design process the SA is responsible for ensuring that all required documentation is completed to the highest standard. The SA is responsible for ensuring that the system built follows the best practices of the platforms that are used. In addition the SA is responsible for ensuring the the build team has the technical support they need to implement the design successfully whilst following Vera’s internal best practices and standards. Complete an online application (attaching CV) here. Applications are due as soon as possible.